Davy, Davy Crockett, the man who don’t know fear! 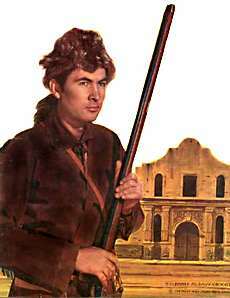 Davy, Davy Crockett, trackin’ the redskins down! Davy, Davy Crockett, holdin’ his promise dear! Davy, Davy Crockett, holdin’ his young’uns dear! Davy, Davy Crockett, headin’ on West again! Davy, Davy Crockett, lookin’ fer Paradise! Davy, Davy Crockett, beginnin’ his campaign! Davy, Davy Crockett, seein’ his duty clear! Davy, Davy Crockett, helpin’ his legend grow! Davy, Davy Crockett, leadin’ the pioneer! This could rightly be called the first miniseries of all time. Under the Walt Disney banner, Davy captured the hearts of both young and old. The show was also a merchandising pioneer as coonskin caps sold like hotcakes. About 100 million dollars worth. The idea of selling tie-ins from a show is accepted practice now but it wasn’t back then! What’s curious about this is that Davy Crockett was only a five feature Frontierland adventure which aired as part of Disneyland. 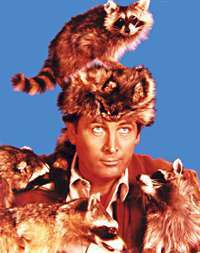 Davy Crockett never got a series of his own. 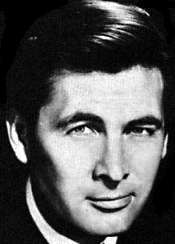 Fess Parker portrayed both Davy Crockett and later Daniel Boone on TV. Many historians feel that this caused a permanent blurring of the two real life men into one entity forever making each less distinct. 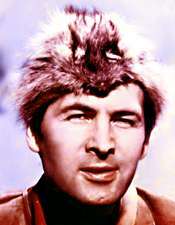 Fess Parker now runs the Fess Parker Winery where you can buy a coonskin cap!